Life with fibromyalgia can be interesting. There are some days where it hardly seems to effect me and others when doing anything takes more effort then most people can imagine. I count myself lucky as I am one sufferer that is able to work and usually go about my daily activities. Even so, I have days where it is hard to get out of bed to get ready to work. 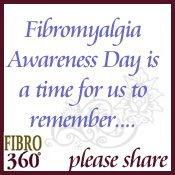 Fibromyalgia Awareness Day is May 12th. And this is one disease that needs awareness. Most sufferers spend years trying to figure out just what is wrong with them. Doctors, unless they are really aware of this syndrome tend to think that all of our complaints are in our heads. I urge anyone that is undergoing this struggle to try to find a doctor that is willing to listen and work with them. Fibro isn't all in our minds. I'm sorry about the fibro. The women in our family have all been diagnosed with that at one point and it's really frustrating to cope with it. My latest has been migraines every week. I recently moved to Hong Kong and deal with similar weather to Seattle/Tacoma (except hotter), so I understand the pain. I've just started acupuncture and herbs. So far, 2 weeks with just small headaches. I'm willing to try anything right now.